Impact Physical Medicine and Aquatic Center has been a long-time friend of PRI and always hosts courses in their cutting edge facility. Years ago Stan Babel CEO of Impact and Ron Hruska MPA, PT collaborated to create the very first PRISM pool. 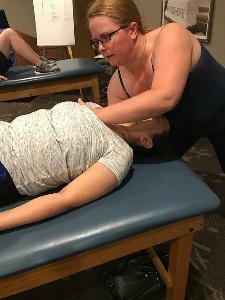 Christie Thames PT, DPT, HFS,PRC and Mara Brandsoy OTR/L, PRC played the role of host and this past weekend I presented Impingement & Instability which is one of my favorite courses to teach. We had two faculty members present Dan Houglum MSPT, ATC, PRC and Sayuri Abe-Hiraishi MS, ATC, LAT, CSCS, PRT. Dan and Sy are excellent presenters and I hope everyone gets a chance to take a course from them. I always learn from both of them and am grateful to call them my friends. We had a total of 8 PRC’s and 1 PRT in the class and they were all great with their input. If you don’t know about I&I, it is a class that coalesces the basic courses into a neuro symphony and teaches MORE on the “why” of Impingement. Why do people impinge and where? We take the time to deeply explain (sometimes more deeply than the attendee wishes 😊) the common sites of pain and the neuro-biomechanics associated with that pain. I cannot emphasize enough how helpful this class can be to your clinical practice and the class reviews were all really good! If you’ve been putting it off I can tell you that I’m teaching it again in July in Georgia and in September in NYC so go ahead and get registered ASAP and I will see you there. I can’t wait. It has been a couple weeks now since we wrapped up our 10th Annual Interdisciplinary Integration Symposium, but we are all still boasting with excitement over the two days that we had on April 19-20th! It was such a pleasure to host Matt Wallden and Phillip Beach, Osteopaths from across the pond who were our keynote speakers this year. Their clinical and educational backgrounds allowed them to expand on topics of tissue restriction, evolutionary and development factors, archetypal postures, and contractile fields relating to the symposium’s overall topic of “Postural Restriction”. Jacqueline Shakar blended her extensive clinical experience in assessment and treatment of the foot and ankle, with different methodologies, including PRI, Graston Technique, SFMA, and others, giving us all further appreciation of the role that the foot and ankle plays in restriction from the floor up and other areas of the body. Robert “Skip” George shared his personal journey as a chiropractor, the restrictions encountered within his profession and also some of the common clinical restrictions that occur in the cervical spine. Heidi Wise opened our eyes further to the role that extraocular muscles have on (or in response to) postural patterns, and possible restrictions that might occur with the EOMs. Pat Davidson took us through a fun journey reminding us how we have lost “authentic environments” that our ancestors thrived upon, and how this is influencing today’s healthcare and fitness industries. Ron Hruska got to further expand on chest wall restriction and the role of clavicle, hyoid and scapula position and alignment. His discussion on management of hyoid muscle ‘sling’ activity was brought to life with the ‘PRI Suprahyoid Sling Model’ that attendees received to help them further understand, and also educate their colleagues, patients or clients how mandibular and hyoid position/alignment influences suprahyoid muscle activity. And finally, it was an honor to have Gabe Adams speak, dance, and answer questions for our attendees on Thursday evening. His story (along with his father Ron) was more than inspiring, and reminded all of us that the thorax runs the show. With ribcage and thorax movement, you can walk, dance, and live life to its fullest! While we are still boasting in excitement two weeks later, we are even more excited to be working on next year’s Interdisciplinary Integration Symposium topic and speakers. Save the date for April 11-12, 2019, and stay tuned for the topic and speaker announcements in the coming months! 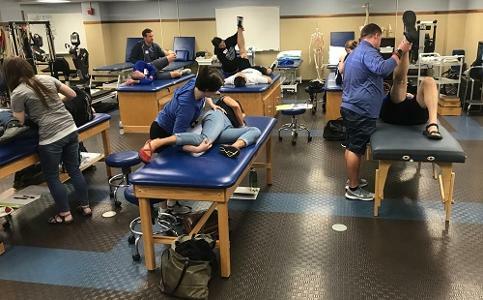 This past weekend I had the pleasure of enjoying teaching Myokinematic Restoration at Indiana State University. Cody Inskeep, ATC who I met originally at a Pelvis Course in Seattle invited PRI back to his stomping grounds in Indiana, and I am very glad he did! This weekend's course was one involving learning on all fronts. We learned about muscles that move an acetabulum over a femur on one side compared to the other in the femoro-acetabular-ilio-sacro-pubic ring of bones and joints that affect position, balance normal asymmetry and allow us to optimize our gait and respiration. We touched on the fact that integration will involve muscular control of this pelvic ring to control both acetabulum and femur, what muscles in what position will assist in this venture, and toward the end of lab and lecture we discussed what we might consider learning if patients still have residual components of symptoms after acetabulo-femoral and femoral-acetabular lateralized control is established. This group was motivated and dynamic, attending for as many reasons as there were clinicians. Thanks Aaron Ford, DC and Canaan McClure for your story about why you attended your first course--a reference to PRI in a book by author Kate Bowler who noted PRI was the reason she could now fully function after a long span of ADL limitation, avoiding scheduled bilateral first rib removal. Thank you Sharon Wellbrook, DC and Tim Demchak, ATC for taking a weekend to learn principles of PRI that you can reference and teach your students in your respective learning institutions. 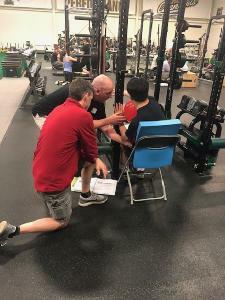 Thank you Denny Wongosari, ATC, LMT among others for coming to learning functional strategies to allow your athletes to better perform. It was my pleasure working with all of these movement professionals as we worked to integrate Myokinematic tests, clinical reasoning and treatment strategies into their respective practices. Thank you Robert Pawlak for recognizing and initiating PRI science into your soon-to-be Orthopedic Surgery practice. Each of your stories encouraged this clinician-first faculty member with regard to the future of integrated medicine. Bravo! Thoroughly enjoyed lab sessions where Kelly (Kelly) Brock, DAT, LAT, ATC, Tim "The Beautiful Mess" Demchack, ATC, Wendy "PS I Love You" Schmidt, OT, former SD native Cara "Caragami" Lemon, ATC, among multiple others helped me demonstrate, nonmanual and manual techniques as well as theoretical principles to the class. As a bonus this weekend, I got to visit the statue devoted of one of the greatest basketball players to put on short shorts--Larry Bird. The statue commemorates the 1979 ISU team that faced Magic Johnson's MSU for the national championship game and was soul food for this old baller. Also interestingly, I learned that Larry played one game of college baseball that year in an effort to increase attendance at ISU's baseball games--and it worked, of course. Thanks again Cody for your time, energy and for your insightful insider information on ISU history and thanks to each participant for making this course a blast!